President David Snell has put it very simply: When people find out about us, they tend to like us. 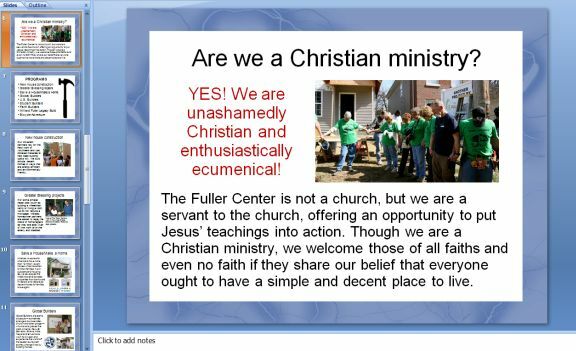 We have a simple new PowerPoint overview of our ministry that you can download and use when speaking about The Fuller Center for Housing and its programs — or for your own personal use. This brief, 16-slide overview is hardly all-encompassing as it would take hundreds of slides to detail all our success stories. But it is a simple presentation of who we are, how we started, our various programs and how people can get involved in our ministry. It also is editable. So, for those of you who are more well-versed in our history, programs and principles, feel free to boil slides down to briefer, bullet points. But if you’re still familiarizing yourself with how we got started, our newest programs like Save a House/Make a Home and the Christian principles uopn which we are built, you are now equipped to present our basic story. It’s free for you to download by clicking here.